Any tea flavored ice cream has its unique flavor that you will not feel bored each time you try it again. The bitterness from the tea, the sugary crunchy from the sugar cane and the fatty bite from the yolks make your ice cream unforgettable. This time we come with the common but famous tea, the matcha or green tea. There’s a funny thing but useful tip for us when buying green tea. The darker green color the tea has, the worst flavor it brings to your ice cream. We should memorize the simple thing “Let make the green tell its color”. In other words, we have to be persuaded that it’s not possible to have a “green” green tea. Green tea is natural so its color can not be compared to the green food coloring. Another important thing of green tea is that it’s expensive and lots of other greenish green tea imitates the authentic green tea. 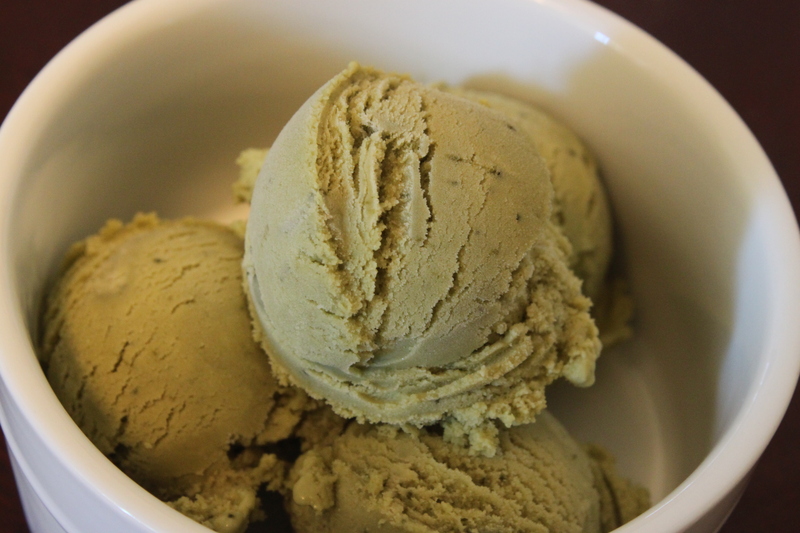 Just as the way you memorize your chemistry’s lessons, you should be able to understand why the store bought green tea ice cream has a very attractive green color ^^. – Beat egg yolks with the remaining sugar until it’s fluffy then add in the green tea. Beat it well just until the beaten yolks incorporates with the green tea. – Pour in a thin stream the hot milk and stir well. – Use a mesh strainer, strain the yolk and milk mixture back to the sauce pan. – In a medium heat, use a flat spoon and stir frequently the yolk mixture. If your heat is too hot, keep it at low-medium heat. – Stir until the custard coat your spoon. The custard cooking process is done when you run your finger on the back of the spoon, there’s no other custard cream comes back to your finger running way. It should take about 10 – 15 minutes for making the custard. Note: Don’t ever heat the custard in a medium high heat. It would be easy to bring your sauce to a boil and your unexpected baby food will appear. – Remove the custard cream from the heat. Stir in the heavy cream. – Keep your custard cream in the refrigerator for at least 6 hours or overnight before pouring it in the ice cream maker. Do as the manufacturer guides. This entry was posted in dessert, ice cream, sorbet, Japanese and tagged green tea ice cream, ice cream, japanese ice cream. Bookmark the permalink. It looks refreshing and delicious.